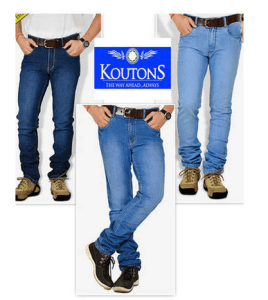 Paytm is offering Koutons/ Charlie Outlaw Pack Of 3 Comfort Fit Jeans (Size-34) worth Rs 3999 at just Rs 699 only. Hurry up and grab it. Sizes 34 and 40 are only available. 5. Enter coupon code – “WW50” in promo code box ifit does not get applied automatically. Note:– You can use the paytm cashback for recharges, bill payments or more shopping on paytm or even on other sites like homeshop18, bookmyshow, justeat, foodpanda and much more….. Augment your style statement this summer by putting these chic black jeans from the house of Koutons. Lovingly crafted to offer you a comfortable fit, this edit is sure to impress you with its novel design that keeps comfort on top. A must have in your fashion wardrobe! This entry was posted in Online Deals, Paytm and tagged Charlie, Comfort Fit Jeans, Koutons, Outlaw Pack Of 3.